Opinions on feed? Talk to ten breeders, get ten opinions. There are things we know about feed and things we believe about feed. I’m not expert in this area, but I’ll share with you what I know and what I believe. First of all, we all have to work within the reality of the area we live in. It doesn’t matter if there’s a new, wonderful Super Feed III available in Oregon if you live in Florida. Unless your budget allows you to pay for shipping and you can store your feed, you’ll have to be content with what is available in your area. Or mill your own. Feed quality is highly dependent upon the mill that it comes from. Your friends in Colorado may have wonderful results from a brand that your friends in New York hate. So when you are asking around, be sure to find out the mill, so you can compare apples to apples. Of these three, fixed cost does not benefit the breeder and his or her rabbits at all. That philosophy will give you the greatest variation within a brand and line of feed. I personally would avoid companies who use that approach. There are benefits to either of the other two. I prefer fixed analysis. I personally believe that the rabbits’ bodies process food at a basic level – how much fiber, protein, and micronutrient is in the feed. There are different types of rabbit feeds. There are low protein versions marketed for pets and 4-H rabbits (I noticed that combo on one feed line’s website). I would not recommend those feeds for show rabbits or 4-H, personally. I’ve seen feeds from 11% to 14.5% protein in those types of pet feeds. Since pets are not breeding, traveling, being exposed to strange rabbits, and are more likely to have more supplements in their diets (aka “treats”), those feeds are probably just fine for them. When I think of feeds for Hollands, I think of 16% protein first, and then 17% as another possibility. I personally believe that 18% is too high for Hollands. Hollands are a pretty temperamental breed, digestive tract-wise, so too much protein and/or too much carbohydrate can push them over their ability to deal, far too easily for my taste. I’m also looking for high fiber and low carbohydrates. If you read my article on digestion, you may recall that high protein and carbohydrates stress the system, while probiotics and fiber assists the digestive system. Corn and molasses are two ingredients I keep an eye on. If they have to be in the ingredient list, they have to be very low on the list. Generally, the top five ingredients give you the bulk of any food product. I don’t know for certain that that rule of thumb applies to rabbit feed, but I think it probably does. Constant access to fresh, clean water is essential as well as feed. Most feed is alfalfa-based. There are Timothy hay-based feeds as well. I don’t have any available in my area (that I know of), so I haven’t needed to research the difference. There is pelleted feed and extruded feed. Proponents of extruded feed say that more nutrients are available to the animal. Opponents say that cooking the feed during the process is bad for rabbits, who were designed to eat a fresh diet. The extruded feed I use adds back nutrients and probiotics. I’m really on the fence about this issue right now, so I can’t weigh in. You absolutely must take your supplemental feed philosophy into consideration when you select and/or evaluate your feed. I talked to a feed salesperson one day who was telling me about a horse owner. The owner had a complaint about the feed. But when they analyzed the horse’s whole diet, they found that the owner had basically supplemented the diet so much it had gotten out of balance. If you buy a 17% feed (which is on the high end, in my opinion, for Hollands), and then you add 1 tablespoon of grains (which is too much, in my opinion, for Hollands), and then you add Show Bloom, or Sunshine, or Docs or some other 25% protein supplement on top of that, and your rabbits turn out to be poor hay eaters because they have more desirable things to eat, then you throw in a baby carrot, strawberry, or some other relatively high carbohydrate fruit or vegetable, I would not be surprised to find that you lose a lot of babies and juniors to enteritis – and perhaps the occasional adult or two. Rabbits, who are designed to thrive on a very low quality diet in the wild, just can’t handle a diet that is too rich in protein and carbohydrates. And fancy breeds seem to be worse. So, you’ve selected your feed from one available in your area. You like the ingredients and the company policy on formulation. You feel that the protein, fiber, and carbohydrate levels complement your supplemental routine (or vice verse). You feed your rabbits the correct amount, having weighed your rabbits and the feed to determine the correct portion size. Things are going along great and then suddenly you have a problem. What should you do? Um... I'm guessing sparkling grape juice is NOT on the recommended foods list. First of all, check your feed bags and dates. Are there any signs of mold, mildew, or moisture? Open feed should be stored in an airtight container, safe from pests, moisture, direct sunlight, and other contaminants. Are there any foreign items or strange pieces in the bag? Is the feed fresh (fresher is better, but I like to stay within 90 days of milling even though companies will tell you it’s good for 6 months for regular feed and 12 months for extruded feed)? Have you progressed forward with the age of your feed? Or did you get a bag that is two months older than the one before? Check out our page on how to decipher the milling date code on some feed bags. Of course, you have been keeping a record of all date codes from every bag of feed you’ve opened, right? No? Me, neither. It’s only when there’s a problem that I wish I had been diligent about that. One day, I’m going to get organized and put a clip board on the wall next to the feed can where I can log in feed codes and the date I began using them. If the feed is fresh, there’s no sign of the bag having been compromised, and you see no foreign objects in it, the next thing to do is start using a bag with a different lot number just until you figure things out. If you see strange items mixed in with the feed or it just doesn’t look right, contact the feed company and ask them to test your feed. I remember when a doe of mine got sick. I dissolved pellets and syringe fed them to her – only to find out later that the bag had been recalled and I was essentially force feeding her the very thing that probably made her sick. She died and I felt terrible. When in doubt, switch bags. If it turns out not to be the problem, you can always use it next week. The next step is simple – ask yourself if it’s fall or spring and if there has been very mercurial weather. Spring and fall are both tough on rabbits. Sudden highs and lows stress rabbits no matter what feed they are on. 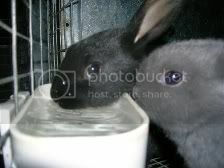 Those are good times to add a probiotic to your rabbits’ water supply to help them deal with these stresses. It is simply not unusual for rabbits to get sick and die when the temperatures are ranging 40 or 50 degrees within 24 hours. Now it’s time to get on the telephone or internet or chat with your friends and neighbors at the next rabbit show. What you want to know is this: are others having the same problems and, if so, is it confined to your line of feed from the same mill. If the answer is yes AND yes, then it’s time to contact your feed representative. If the answer is yes and no, then consider this: all feed companies depend on the same types of fields, and Mother Nature’s whims, to provide the raw ingredients for their feeds. If there’s been a drought, or too much water, or unusual temperatures, or not enough sunshine, all companies deal with the same issues. There could be some variation across feeds that we all just have to deal with. But maybe everyone is having problems with their rabbits and it has nothing to do with feed. Perhaps there’s been a lot of rain and there’s just more mold for the rabbits to deal with compared to normal. Perhaps winter is early or summer is hotter than usual. I also believe that rabbits are tapped into some sort of cosmic pulse that we just can’t feel. If I’m having problems with getting does to catch, I’m not surprised to find out that a friend in Nova Scotia is having the same problem. When my friend Linda is getting does to lift for bucks, I’m not surprised to find that mine will do the same thing. Certain months, all does have their babies early or on time. Other months, they all have them on time or late. Sometimes, only the best milking does have milk. Other times, even my worse milker is overfeeding. It’s easier to blame the feed company. They have the ability to pay and make things right. Just remember that sooner or later, that money is always paid for by the people who buy feed – we’re where all of the feed company’s money comes from. Make sure that it really is their problem. Sometimes they are in the wrong, of course. If you have eliminated the other possibilities and find that other people on the same brand and line of feed from the same mill are having problems and it’s not just happening to everyone, then have them come out and take samples of the feed. Be sure to keep samples for yourself. If they say that there’s nothing wrong with the feed and you are convinced that there is a problem, you may need to have the samples evaluated yourself. If you have to change feeds suddenly due to bad feed or the unavailability of your feed, I suggest adding a probiotic to your rabbits’ diet for a few days to help with the transition. Try to delay any other stress-related activities until the transition is complete. Increase your hay allowance if you are not already a daily hay feeder. If you are changing by choice, be sure to do so gradually to minimize the changes of digestive upsets. Hmm... what did she pack me for lunch? When evaluating your new feed, wait several months before making your judgment. I think that changing feed is like changing shampoos. When you change shampoo, your hair has the benefit of whatever the old shampoo did best and now the benefit of whatever the new shampoo is doing. You will most likely love the results of changing. But over time, you see just what the new one can do, and that may or may not be better. Likewise, at first you have the benefit of whatever your old feed did best and the benefit of what your new feed does best. Over time, you will see the real results of your new feed program. Also, some problems coincidentally correct themselves when you change feed. The rain stops. The weather evens out. Mother Nature turns a page in her book. You may attribute the change to your new feed and give it more credit than it deserves. Be sure you ask around to see if those who did not change also saw an end to their “feed” problems. By the way, some people feed half one brand and half of another. They do this partly to get the average of the two benefit-wise. But they also safeguard against having to make a sudden 100% feed change. If there’s a problem at one company, they can go with the other for a while until things are straightened out. There are so many issues with feed that it’s likely to keep your head spinning for years if you are seeking the ideal situation. Measure, observe, record, and analyze your data to help you make the best decisions. Talk to others, both those who feed the same feed and those who feed something different. Take your breed into consideration. Likewise, take the ebb and flow of the natural world into consideration. 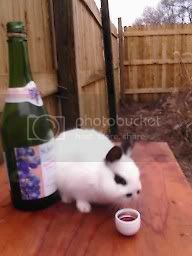 And don’t let feed worries sap all of the fun of raising rabbits. 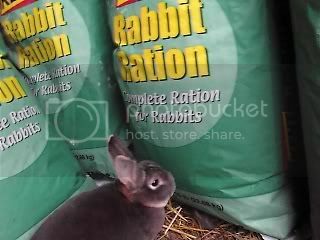 It is definitely possible to successfully raise rabbits even if you can’t obtain the perfect feed.